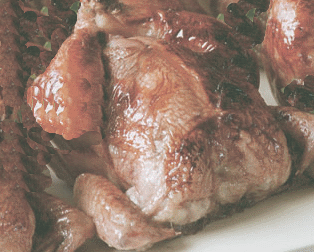 Rock Cornish Hens and Stuffing is a tasty meal that requires some time to prepare and cook. Those who have prepared this meal will tell you it is a meal for special occasions. When you master this meal, you will have prepared yourself for Thanksgiving. Louise would pick up a couple of the game hens from the local butcher and apply her holiday cooking spirit to them. While we have little on her reasoning and the hand scratch written notes were a bit difficult to cipher, the meal is delicious. This type of bird is a cross between two different types of chicken. It is a commercial type bird that is commonly used for broiling. The Rock type and Cornish are bread to have a more plump breast and it develops within a short amount of time. When the hens weigh in about 2-3 pounds the bird is then harvested and put to market. Mix rice, mushrooms, black pepper, oregano, garlic salt, butter, bread crumbs and eggs together. Mix well and make sure all is moist. Stuff Hens and bake in oven for approximately 1 hour+/- or until done. Put drippings in a sauce pan with brandy, cherry syrup, lemon juice, garlic salt, ginger and oregano. Add a dash of black pepper, salt, flour, bouillon. Bring to a boil then reduce heat and simmer for about 30 minutes. Strain, then put cherries in and cook 15 minutes longer. Put Hens on a platter and pour two ladles sauce over them and serve. Make sure the inside of the hens have been thoroughly rinsed and remove excess water. Do not over cook the hens. It is preferred if the skin is on to retain moisture. Careful not to let the skin become too crispy. Hens should come off the pan whole and not burnt. Return to Easy Everyday Cooking Recipes from Rock Cornish Hens.